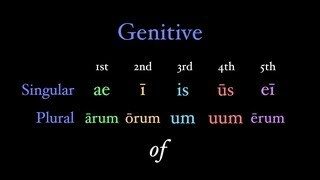 The genitive case is used when one noun limits the other. 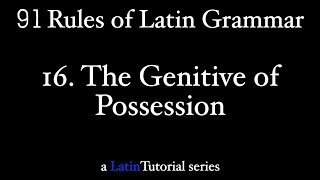 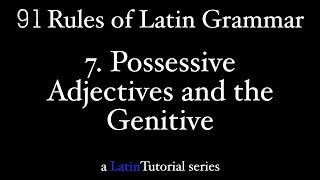 We often translation this limiting (or dependent) noun with the word "of", but, as we see in this video, the genitive case in Latin can be much more colorful that just a simple translation. 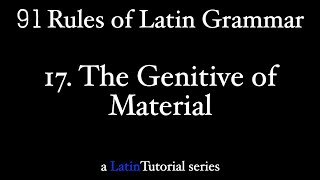 This video covers the basic concept of the genitive. 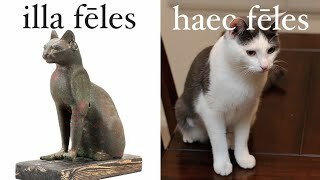 We will get into more specific uses in future videos. 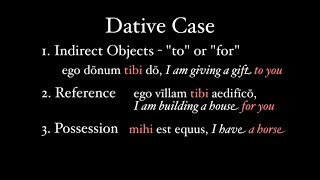 The vocative case is used for identifying the person or thing you're speaking to. 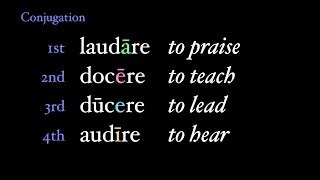 It doesn't have a role in the rest of the sentence. 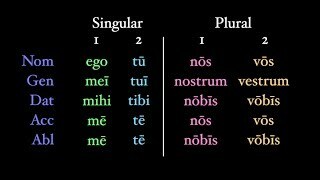 And yet, for the most part, the vocative is identical to the nominative in form. 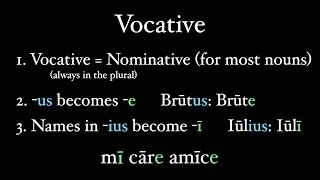 Hey you, learn more about the vocative in this video, with some fun poems by Martial. 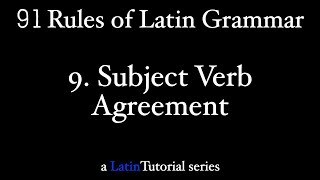 We save maybe the most basic rule of them all for lucky number 13 - the noun that controls the verb (also known as the subject) is put in the nominative case. 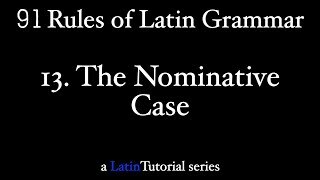 Learn more about the basic use of the nominative here! 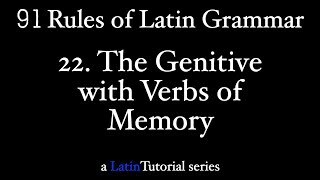 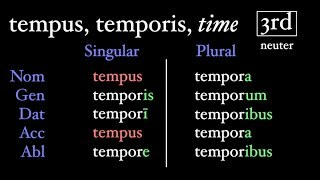 The basis of verb conjugation in Latin comes down to its subject. 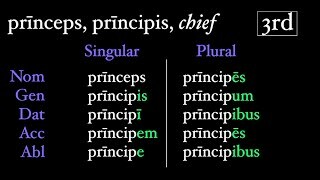 Is it first person, second person, or third person, and singular or plural? 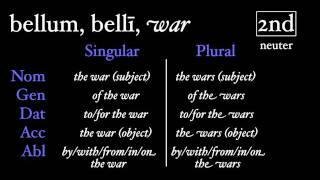 This will change the ending of the verb and thus its meaning. 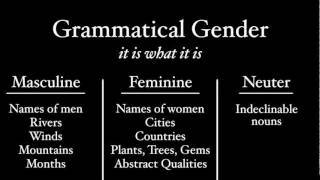 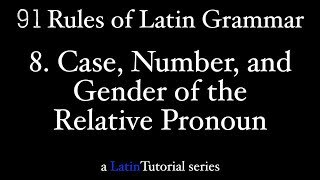 The second rule of Latin grammar is that adjectives will agree with the nouns they describe in case, number, and gender. 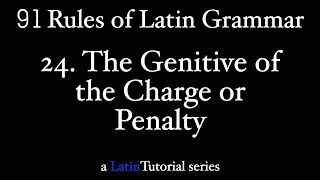 But this rule can lead to some interesting situations, and allows for great flexibility in Latin word order. 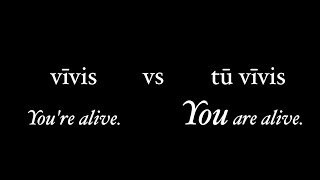 From here comes some of the great beauty of poetry. 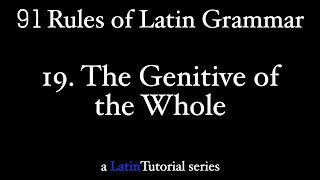 The first rule of Latin grammar is that two nouns that refer to the same thing are going to be in the same case. 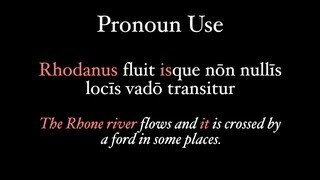 This is called apposition, and it's commonly used with names and titles (like king). 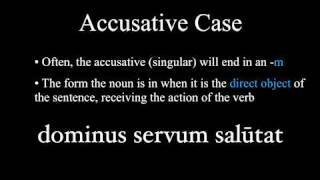 This video explores how Latin uses apposition. 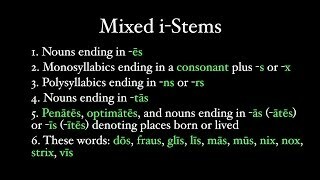 The supines are an amazing to say bit of complex grammar. 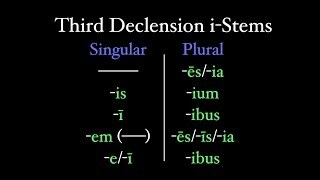 It is a strange fourth declension verbal noun only found in two cases: the accusative and ablative singular. 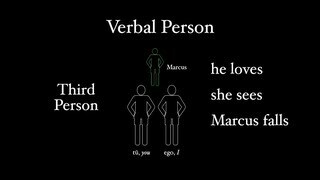 This video covers formation and translation of this very weird noun... verb... verbal noun. 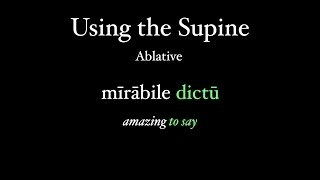 Mirabile dictu! 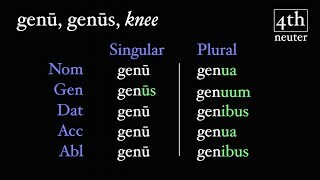 The fourth declension neuter is essentially just two words: cornu and genu. 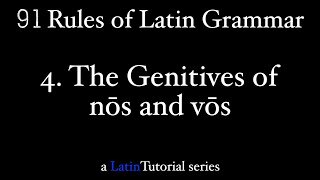 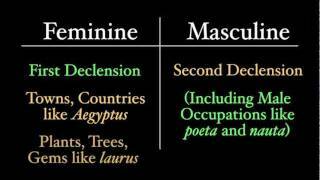 These are the only ones you'll ever see really, and this video covers their declension and use. 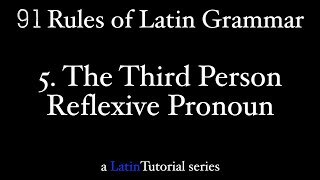 The relative clause, which is introduced by the pronoun qui, quae, quod (who, which), is likely the most common subordinate clause in all of Latin. 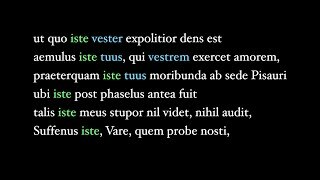 It even makes an appearance in the first line of Vergil's Aeneid, and in the first sentence of Caesar's Gallic War. 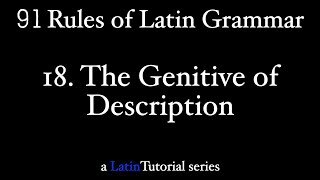 This video gives a introduction to its declension and use in a basic Latin sentence. 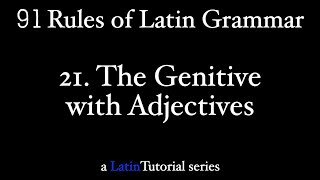 Latin, like some of its modern daughter languages, doesn't often require a subject in the sentence if it is obvious in context. 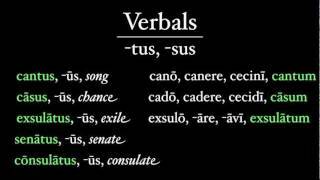 This is especially true since each verb ending is different in both spelling and sound. 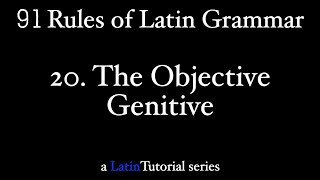 Learn to anticipate and understand the subject just based on the verb ending! 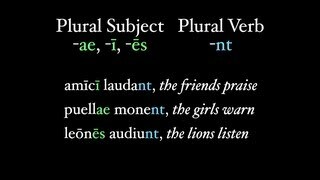 Unlike English, Latin is an inflected language (which means that the endings of nouns change based on its role in the sentence) and divides its nouns into groups called declensions. 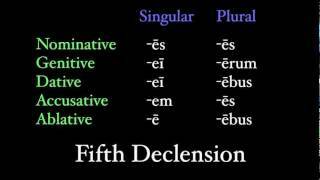 Each declension has predictable and fixed patterns for changing endings to go along with the changing grammar. 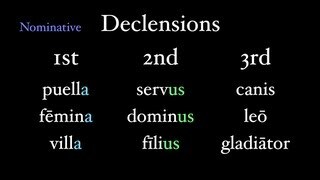 This video discusses at a very basic level what exactly declensions are and how you can identify the declension of a noun given just the nominative and accusative cases. 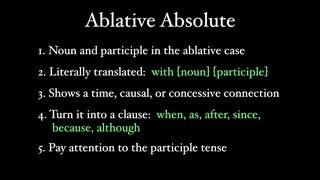 Ablative absolutes are a peculiar and unique use of the ablative case, not necessarily found in English today. 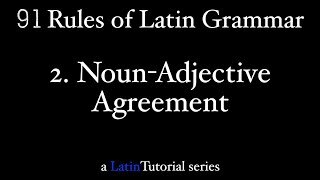 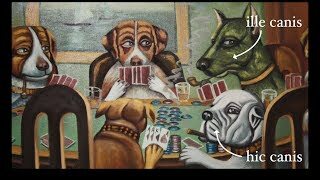 With this video watched (or after this video is watched), you will be able to understand and translate ablative absolutes into properly-sounding, modern English. 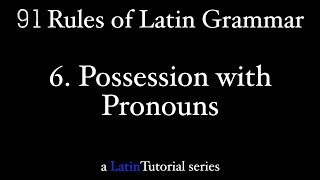 Nouns can be people, places, things, concepts, quantities, and many other things. 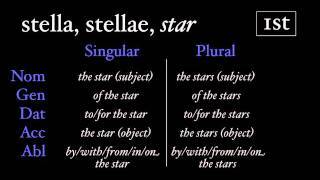 So why not define a noun by its role in the sentence, rather than just by naming its constituent parts? 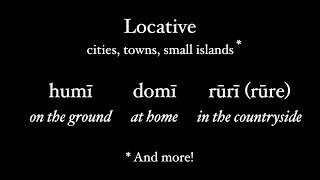 You'll find that a noun like this is far more descriptive and a little bit more interesting. 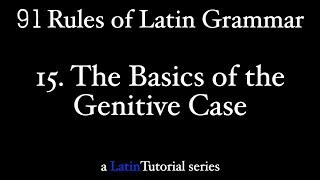 One of the big hurdles for any beginning Latin student is dealing with the case system, which essentially does not exist in English. 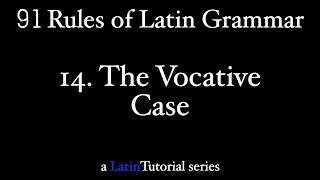 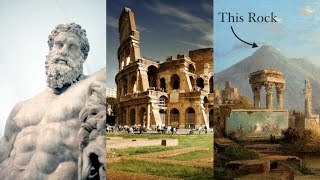 This video is a basic overview of the six main cases in Latin: the nominative, genitive, dative, accusative, ablative, and vocative.